Most users don't realize how much valuable data is in their network traffic. With a few simple tools, an attacker can quickly pick out cookies, passwords, and DNS queries from a macOS device as it covertly streams the victim's network traffic to the attacker's system. Here, we will cover two methods for analyzing packets flowing from a Mac. The first method requires Wireshark, which has been covered on Null Byte before. However, using Wireshark to analyze packets from a remote device in real time may be a new concept to some readers. Method two requires Tshark, Wireshark's command-line network protocol analyzer. Tshark is great because it only prints the information we ask it to, unlike Wireshark, which displays everything and requires us to sift through thousands of packets. Readers who prefer command-line tools over graphical applications will appreciate Tshark and its simplicity. I'll try to be brief about installing and using Wireshark since it has been featured on Null Byte several times before. So if you're totally new to Wireshark, it would be a good idea to review all the guides we have on it if you want to be proficient with the tool. By default, Wireshark is included in most versions of Kali Linux. There are a few versions that don't include it, so I'll quickly cover how to get it if you don't see it in your Kali version. First, run the following command to ensure the most recently tested and curated (by the Kali developers) version is available and download it. 1 upgraded, 0 newly installed, 0 to remove and 963 not upgraded. Need to get 57.2 kB of archives. After this operation, 3,072 B of additional disk space will be used. When that's done, Wireshark can be found in the "Sniffing & Spoofing" category in the "Applications" menu in Kali. Rather than saving the packets to a PCAP (as described in my previous article), we can pipe the data coming from the Netcat tunnel and view it in real time. This can be achieved using a "named pipe" and the mkfifo command to redirect the raw packets directly into Wireshark. In Kali (the attacker's system), use the below command to create a named pipe. Then, start a Netcat listener and direct (>) the output into the pipe called "wiretap" in the /tmp/ directory. The pipe name ("wiretap") is completely arbitrary and can be named anything you like. Netcat will listen (-l) on port (-p) 9999 for incoming connections from the macOS device. 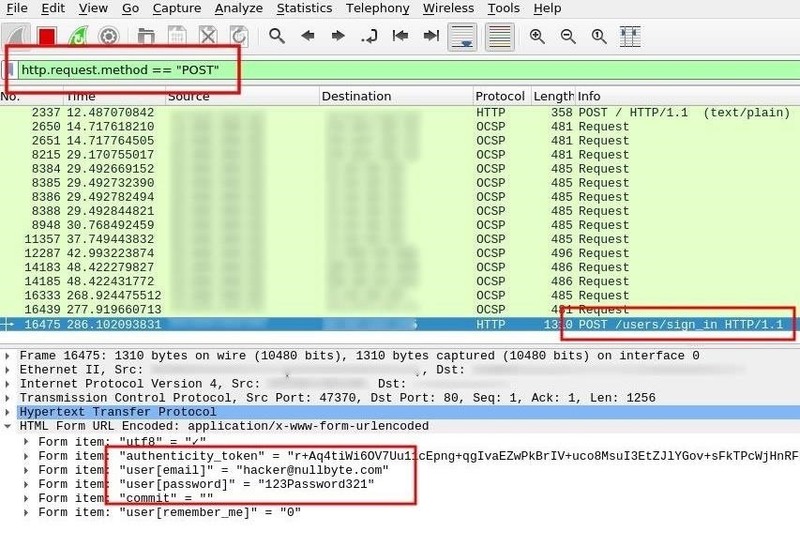 Now, open the wiretap file using Wireshark with the -k argument to start capturing packets immediately. The input file (-i) should point to the wiretap pipe we just created. Wireshark will open but won't display any packets yet. The setup on the attacker's Kali machine is complete at this point. We need to run the tcpdump command now on the macOS device to instruct it to send us the victim's packets. From the Netcat backdoor, first, use the ifconfig command to learn the target's wireless interface name. The interface with the "inet" address of "192.168.0.133" is my MacBook's wireless interface. In my case, the interface name is "en0" but this may vary based on the macOS device and version. Use the interface (-i) argument in the below Tcpdump command when exfiltrating traffic to the attacker's system. In this command, tcpdump will write (-w) the captured data directly into the Netcat tunnel. The 1.2.3.4 address should be changed to the attacker's IP address hosting the Netcat listener. This can be a local IP address or a remote VPS IP address. As long as both terminals are open, Tcpdump will send network traffic directly to the attacker's system and into Wireshark in real time. Unfortunately (for hackers), many websites today use encryption that prevents sniffer's from learning login credentials. There are still benefits to monitoring traffic for domain names belonging to websites sending and receiving encrypted data. 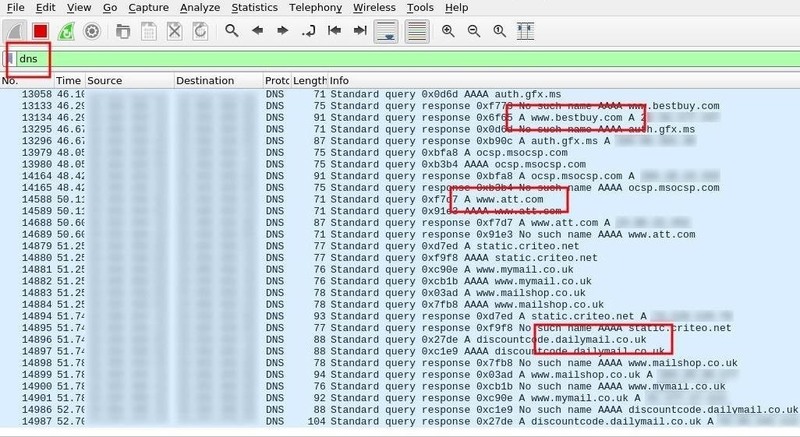 We can learn a lot about a target by analyzing their DNS traffic and favorite websites for future phishing attacks. To filter DNS transmissions, enter the dns string into Wireshark's display filter bar. Most popular websites use encryption, but there are still many protocols and millions of websites that don't properly encrypt sensitive data. POST data will likely hold the most compromising and revealing information. Here, we may find, usernames, passwords, home addresses, email addresses, social security information, chat logs, and much more. To filter POST data, enter the http.request.method == "POST" string into Wireshark's display filter bar. Alternatively, we can also use Tshark to tap into the /tmp/wiretap stream we created earlier. Tshark isn't necessarily better than Wireshark. There are some pros and cons to both tools. Tshark will only display what we ask it to, which means we may miss some minuscule (yet valuable) data because we've narrowed the display filter to something too fine. Adversely, Wireshark may display too much information and cause us to miss some useful bit data. Again, pros and cons to both tools. Tshark is available in the Kali repositories and can be installed using the below command. 0 upgraded, 1 newly installed, 0 to remove and 945 not upgraded. Need to get 186 kB of archives. After this operation, 404 kB of additional disk space will be used. Selecting previously unselected package tshark. To dump DNS traffic, use the below command. We'll filter out packets on port 53 and DNS queries using the dns.qry.name argument. The Tshark arguments (-e) are exactly like Wireshark's display filters and enabled using the -T fields argument. We can easily discover a target's favorite websites using this data and begin preparing phishing pages for social engineering attacks. Filter out POST requests (http.request.method == POST) containing the string "pass" to find passwords sent in plain-text. Also use several field (-e) arguments to print the full URL (http.request.full_uri), the POST data key (urlencoded-form.key), and their values (urlencoded-form.value). The keys will help us understand how the values are formatted. For example, a key might read "username,password" while its corresponding values read "tokyoneon,Pa$$word321." Below are two examples. Some POST data will contain multiple parameters making it more difficult to interpret. Here we can see an authentication token, followed by the user's email address and password. Tshark and Wireshark are both excellent tools for sniffing packets. Readers who also prefer to work in terminals may prefer Tshark over Wireshark. For a comprehensive look at display filters, check out Wireshark's official documentation.